Waffles and Pancakes follows two hamsters, namely Waffles and Pancakes. 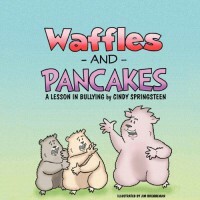 Through their eyee, the young reader will be able to read and talk about difficult lessons, in this case bullying. It approaches the subject with great tact and the illustrations are clean and crisp making it very inviting and and easy to look at. For the very young it will allow them to realise that simply words can hurt. This is a great way to introduce such subjects and is a lovely book.